A few years ago while reading Gutierre Diaz de Gamez's biography of Don Pero Niño, El Vitorial, I came across two passages which gave me pause. The translator, Joan Evans, helpfully provides an endnote to the first passage, which includes the original Castilian "Armaba muy fuertes ballestas à cinto". Evans considers this a reference to goat's foot levers, but to me it seems more likely to be a reference to a spanning belt. Drawing very strong arbalests, especially at the turn of the 15th century, with a belt hook would be quite a feat. I thought that belt spanning had been devalued to the point of obsolescence by the invention of the goat's foot lever, the wider proliferation of armour and the use of heavier armour, so that was a ding against my interpretation. However, after examining some 15th century artworks, I found some corroborating evidence for my view. The belt spanning method, far from going by the wayside, seemed to be common even to the end of the century. 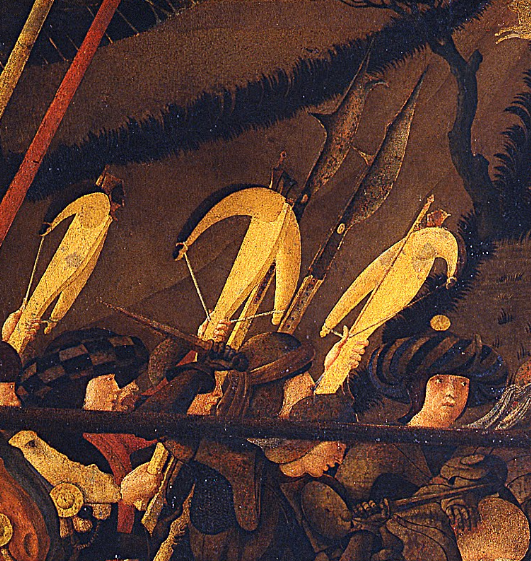 First the crossbowmen in Uccello's Battle of San Romano. Of those that you see spanning their weapons, they all seem to be using belts. And second, Signorelli's Martyrdom of St. Sebastian. In addition to the pulley system that seems to be in use here, the middle crossbowman is also wearing a spanning belt. Another detail I've observed in this painting is that the prod on the belt-and-pulley spanned arbalest is distinctly made of organic material (horn, wood, I don't know what), rather than the steel prods of the other two of which at one is spanned by goat's foot lever. 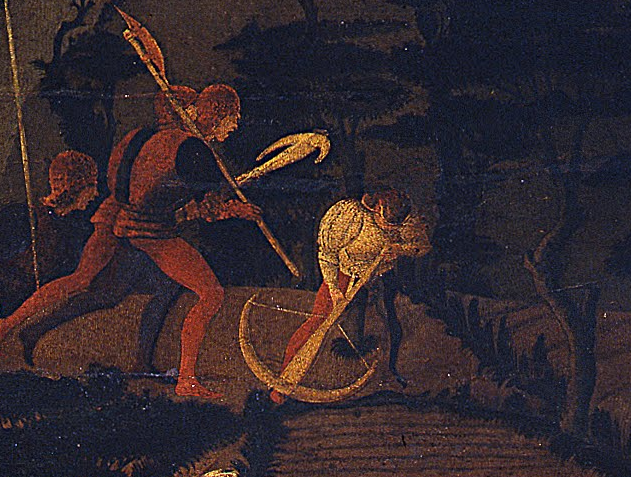 Similar prods also feature on all the bows in the Uccello painting. I'm not sure of the significance of this, but it seemed worthwhile to mention! I've found a number of other artworks of which I don't know the exact provenance, but can post them later if desired. If these prods had weaker draw weights than other types of crossbow, why do they see such frequent employment, even against heavily armoured foes? My best guess is that aiming for the face was a key tactic for fully-armoured opponents, and wounds to the limbs could be made against ones armored with only a breastplate or brigandine, and the psychological effect of arrow fire would still be valuable. However, these same tactics could be adopted by someone using a 200 lb crossbow, rather than the very strong examples preferred by Pero Niño. So it seems to me they must have some kind of effectiveness beyond what I can guess at. If anyone can tell me why the "best crossbowmen" should be proficient in this method, or why it was preferred by Pero Niño, I would very much like to know. If I see it correctly, spanning from the belt is done with the foot, which means the arms doe not tire from spanning. Those same arms you need later to aim, and vigorous motion before precise motion can make the precise motion less precise. This is but a guess from someone who has never spanned a crossbow by goat's foot or girdle, so take it at its value. Crosbows loaded using belts survived into the XVIth century Iberia. Better rate of fire, easy to use, and against the very common unarmoured foe, works well. BTW, the Victorial is a very interesting piece, and has been printed since centuries ago, so it's easy to find for free in Spanish. A goatsfoot pulls the lever away from the tiller and over a locked nut while the wippe, belt-hook, windlass and cranequin all pull the string while holding it more or less against the tiller into a un cocked nut rolling it into locked position in the process. Could this have anything to to with goatsfoot levers being used less on organic prods. I would guess you would want less "uppwards" or "sideways" force on laminated prods especially but I am no expert. In that case it might just be that the best crossbowmen used laminate bows an therefore belt hooks are the go to method, though I am wildly speculating here. Interesting idea! I think there's certainly value in keeping the arms from tiring. I'm hoping to get the latest printing this year. That possibility has crossed my mind, but as you say it's just wild speculation. One thing I did come across, which seems to help on at least one front, is the attached image from the Löffelholtz Codex of 1505. It looks like a pulley system for belt spanning not unlike the one in the Signorelli painting, and appears next to a crannequin. 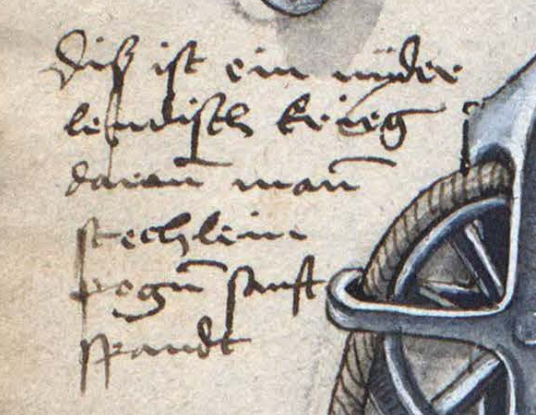 It is hard to say without knowing 16th century script, whether this particular pulley system is for a springald or a handheld crossbow, since the section it appears in shows both. Still, it is something! This is curious and I am more inclined to think it is some misinterpretation of the words or the actual meaning or indeed the guy who wrote it wrote badly or indeed misinterpreted what thought he knew. There are many issues to address here. "Very strong arbalest" - very strong period or very strong amongst belt spanned bows? Belt spanning can in no way be used to load bows that are easily loaded with windlass or indeed a goats foot lever. A belt with a doubler pulley can be used to span a bow much heavier than a straight belt, but the action required is of course 2:1 and this in fact is rather tricky and height of user really starts to be relevant. Composite bows often have slightly longer draws and this of course compounds the issue. In reality this does limit the power that can be spanned. I am no athlete, but can span around 220lbs with a belt, maybe a bit more. with a doubler belt around 380lbs. I am sure a better men than me can improve on this. The action of loading and shoot a belt spanned bow is pretty much your whole body being used and so all of you gets tired; it is very physical. The rate of discharge with a goats foot bow is about the same as a belt spanned, is easier to load physically and you can load more powerful bows, maybe up to 600lbs. There is no inherent accuracy differences between the spanning types. I too do not know the answer here, but M.Nordlund may perhaps have nailed it..........it is plausible. Simply put, I can see no reason other than lower cost, to favour a belt over a lever. I can imagine, that, save for other stuff, belt stays on you, and you don't have to think about it that much? While goats foot is pretty clunky piece of equiipment you have to drag around somewhere, even if you have to run, leap, etc. Gutierre Diaz de Gamez was Pero Niño's standard bearer, and fought in the relevant campaigns. Mistakes are more likely my own than his. It is possible he fabricated or exaggerated some things, but in general he seems to have been sincere. At one point, at Don Pero's insistence, the sailors take him to see "London", though only its port which is called Southampton. There's another relevant section that I originally left out because transcription is a chore, but it turns out you can copy/paste from the PDF version! While matters were thus, Pero Niño fell ill. The Pope’s knights came to see him, and there likewise came to him the most famous crossbowmen that were in that country, Antonio Bonhora, Francisco del Puerto, and other good men with the arbalest, drawn thither by the fame of Pero Niño, to see and try his arbalests. He had many good ones with him, and one amongst them, famous and strong, which was called La Niña. They tried this one, but could not bend it. Then Pero Niño rose from his bed, although it was the hour of his fever, and putting on a shirt, bent the arbalest from the belt. It seems that attempting to belt-span each others' crossbows might have been a kind of common competition, so I think it more likely strong for a belt-spanned bow, since Diaz de Gamez makes no comparisons with other spanning methods. On the other hand, I'm not sure why a bow of middling strength would be the object of admiration in such a context, let alone fame. 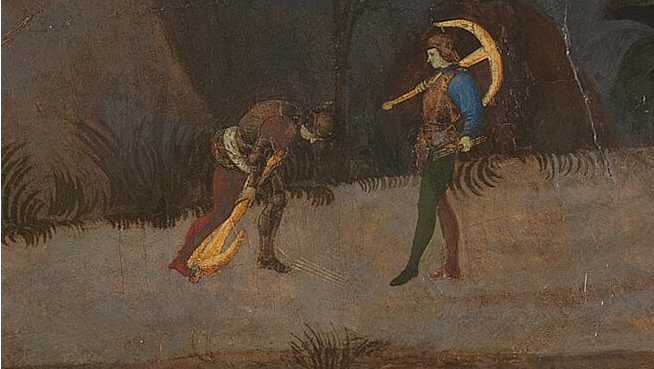 You can just barely make out a similar bar on the end of the tiller in the Signorelli painting. In The Battle of San Romano, it's also interesting to note that the one foreground image of an arbalest being loaded shows the crossbowman bringing something to the hook from a straight-legged position, stirrup on the ground. This may also indicate some sort of pulley system or other spanning method that uses the belt hook. Do you think the four pulley spanning device shown by Löfferholtz offers any mechanical advantage over the two pulley system you use in your video? If not, I don't understand why one would include the extra pulleys at all. Maybe something to do with the peg holes? That is good to know. Is the limitation on the goat's foot a matter of physical strength or of materials? Thank you very much for your comments and expertise, Tod. The previous page shows a crannequin and another spanning device. There he calls a crossbow an "armbrust", so by using the term "stechlein bogenn" it seems the author does distinguish a separate bow type, and that spanning method corresponds to it. Depending on if she or I can improve the translation, there might be something more interesting coming up. 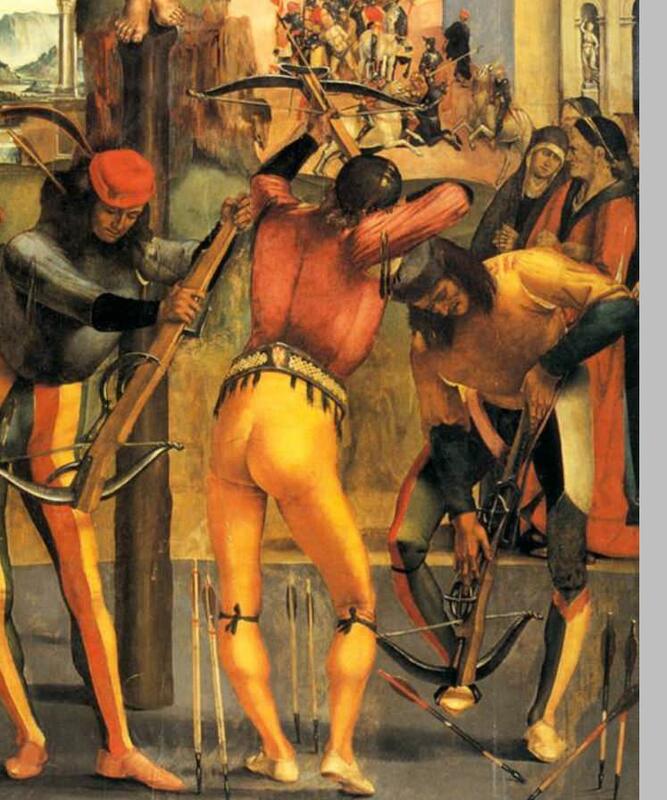 I'll add that I don't think the phrase "with the belt" necessarily excludes the use of a pulley device, especially if we accept that both the Uccello and Signorelli drawings suggest the hook might be applied to a pulley rather than the bowstring itself. Does anyone know how old the crossbow really is? Was it used in Asia earlier than in Europe?